We look at two cases of serious reverse curve (C-shaped) moving towards straight, with two different symptom patterns: head/neck and shoulder. These cases are featured because they are realistic both in the their changes, and their time frames. Recently I took a moment to answer a question on the website Quora asking about the possibility to restore the cervical curve when the neck is in reverse. In the Quora article, I state that it’s more common to see a full or near reversal of the curve when the neck is only slightly reverse, or it’s kyphotic. Especially if the patient is beyond childhood, when degeneration and trauma can limit some restoration of the curvature. Want to learn more about reverse cervical curve? Here is my comprehensive article. I also state that true reverse curves are more likely to return towards a kyphotic (straight) configuration rather than return to a normal curve. Perhaps with more time some of these curves will continue to improve. however, most of the progress examinations I’m conducting are happening in 3 to 6 months after the pre-treatment exam. What this process can look like varies between patients. I wanted to take a look at the progress of two similar reverse cervical curves with symptoms at different ends of the neck. One patients has neck pain and chronic, recurring headaches. She is a female in her late 40s. The other has chronic pain behind his left shoulder blade. He is a male in his young 30s, and is incredibly fit. Please note the degeneration in between the C5/C5 vertebra as evidenced by the lack of space between the bones. The neck moves from a reverse c-curve to a kyphosis with a slight reverse at the top. Mid-neck moves 7 millimeters total, from -10 to – 3 mm using the depth method of measurement. As her alignment improved, so did her symptoms. 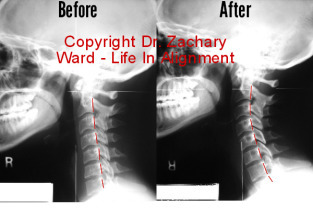 At the time that this patient moved out of the area she was largely free from headaches and neck pain. This video features a morph between the images. The most reversed neck bone (vertebral segment) is C4. You might notice how there is more space between the vertebra suggesting less degeneration of the discs. If you look closely, the back joints show a lot of overlap, and therefore this patient has a lot of cervical rotation that has to change in addition to the curve. Like the patient above, the symptoms (shoulder/shoulder blade pain) diminish when the curve improves. The alignment shifts by 5 millimeters.